As a Christmas present I was given a slim volume on cheese making, a gift from my elder sister. There is one question puzzles me. And it has always puzzled my sister’s oldest friend, who has had a keen interest in history all her life. Why is it in England that we have always been so fond of cow's milk and its dairy products whereas as a nation we have tended to shun goat's and ewe's milks and their cheeses? Generally speaking this seems to hold true for our Medieval forebears as well. Cheese making, but not by monks. A Medieval/Renaissance woodcut. The slim volume, alas, did not answer this directly. But it did shed light on the question by revealing what I believe to be a very strong hint. It let slip the interesting fact that Wensleydale cheese, made by Cistercian monks in Yorkshire since 1115, was originally made from sheep's milk. Cow's milk was only substituted much later. Now, I have also learned from the radio this week that the Cistercian monks, when they broke away from the Benedictine order, preferred a hard life not an easy one. So they settled in very remote locations. One imagines then that in Upper Wensleydale the Cistercian monks were, with help from lay shepherds who were part of their self sufficient community, able to tend flocks of milking ewes. Hardier and less expensive to keep than cattle, they would have endured the wintery conditions better than cattle or indeed the monks themselves. In fact the monks had to relocate to Lower Wensleydale in later years because of inclement weather and hostile natives! 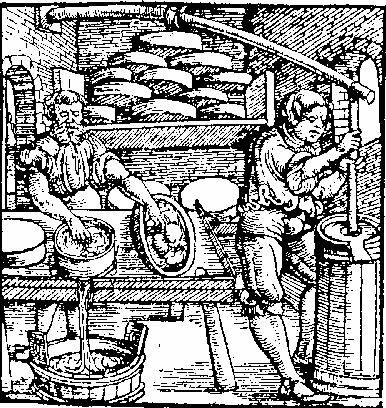 Cheddar making in Somerset goes back more than 800 years with records from King Henry II’s accounts showing that in 1170 the King purchased 10,240 lbs (4.6 tonnes) of Cheddar cheese at a cost of a farthing (a quarter penny) per pound weight. He declared Cheddar cheese to be the best in Britain and his son Prince John (later “Bad King John” reigning between 1199 and 1216) thought the same. Why? Because there are records of him continuing to buy the cheese for the great Royal banquets. And for other ancient English cheeses, whose large scale production started in the Middle Ages, there is tantalising early reference to sheep’s milk. Originally cheese made in the valley of the River Severn was made from the milk of Cotswold Sheep. As early as 1498 so much cheese was being made in Gloucester that a permanent market was set up in the City of Gloucester, the site of it’s indoor market today. But by Tudor times (post 1485) cow’s milk was the norm across the Vale of Berkeley and down to Bristol. This came mainly from Old Gloucester cows whose milk was ideal for cheese-making with small fat globules that made a fine even textured cheese. In 1745 cattle plague all but wiped out the breed and was replaced by the Longhorn cow, with no reversion back to sheep! 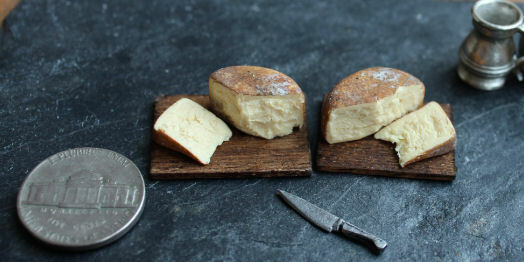 Double Gloucester cheese, probably made with the previous evening's skimmed off cream set by, was a prized cheese comparable in quality to the best Cheddar or Cheshire, and was exported out of the county. Whereas an inferior Single Gloucester tended to be consumed within the county. And all this without mentioning that Cheshire cheese is England's oldest cheese! The claim that Cheddar cheese is referenced by name in the Doomsday Book of 1086 cannot be substantiated, it would seem. A rival claim is for Cheshire cheese, also not substantiated, but actually likely to be England's cheese of cheeses! The Doomsday Book would amply demonstrate, I am sure, that many more sheep, goats and pigs were kept than indulgent milking cows in the 11th century! I suspect the same probably cannot be said of beasts of burden, oxen. So a picture does emerge of England’s dairy practice in Medieval times first evolving patchwork like around clusters of sheep’s milk production, and then moving up a gear as the Englishman’s appetite grew for cheese grew with cow’s milk production concentrated in valley areas of lush pasture. And just a word on Parmesan cheese, or Parmigiano Reggiano® as it is now known. An ancient cheese made by monks in Parma, Italy from skimmed cow’s milk. Imported into England in Medieval and Tudor times, Samuel Pepys buried his "Parmazan cheese" during the Great Fire of London of 1666 "...as well as his wine and some other things" to preserve them. 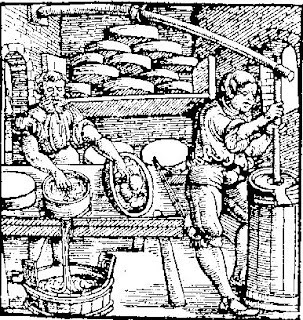 Historical documents show that in the 13th and 14th centuries, Parmigiano (Parmesan cheese) was already very similar to that produced today, which suggests its origins can be traced to a far earlier Medieval times. And sheep rather than cows originally I wonder? And what about England’s “red” cheeses such as Red Leicester? Lets just leave that story for another blog post shall we? But here is a miniature taster by MedievalMorsels!